Hi everyone I'm Jack Red, I am back with more reasons why I prefer Mortal Kombat over Street Fighter. Remember folks this is strictly my opinion I do apologize if anything I said gets you upset. Everyone has different taste in things especially what they like in their fighting games. For Mortal Kombat is one of those game series I really can't get enough of. I am going to be honest I always felt Street Fighter 2 was too repetitive. You can change the speed from slow to fast or in vice versa. Especially near the end, your opponent start getting cheap. I felt when I lose at a Mortal Kombat game usually it is my fault that I loss. This also considers the bosses like some strategies won't work on them. In other modes of play, you get use to how each mode plays. To me SFII has brought many hours worth of anger instead of joy. In newer Mortal Kombat games, there's so much to do. Even online is getting better with each game. I do enjoy playing Test Your Luck that will test you in many ways all decided by random. Even since the beginning, Mortal Kombat has some clever secrets that people still talk about today. Like fighting Reptile in Mortal Kombat 1 or any of the hidden characters in MKII. There is easter eggs cleverly used in newer MK games. Erron Black usually fires a bullet with most character's name on it. In Predator's case what's written down instead is a tribute to the famous line by Schwarzenegger. One dlc pack also adds Predator inspired costumes to the game. I also like Johnny Cage saying in one of his intros, "It's game over man." He was referencing a popular line from the movie Aliens. Most guest characters' finishers are easter eggs in themselves. Speaking of easter eggs, who remember the rumor of Ermac in MK1? It was a glitch in the arcade version that the team themselves couldn't find. This later inspired the character Ermac whose a fan favorite since then. A similar case happened with the character Skarlet except she got introduced officially in the reboot. The Krypt can take hours to fully obtain everything it has. In both Deadly Alliance & Deception, you have several different colored coins to buy many coffins. I also like in Deception you have to find keys for particular coffins. Sadly this mode was ruined by Mortal Kombat: Armageddon. Thankfully the reboot made it awesome again. I like in the newer versions you get to explore as if you were there. Especially true in MKX since you have two major sections packed with content. It might be over whelming at first but quickly gives you more reason to play them. This mode by itself made some of the newer MK games worth replaying. I also like they added some humor when they can. Yes you have to memorize to the best of your ability which coffins or other stuff you buy. In MKX, you now can get attack by enemies. Some of them are limited time meaning you have to rush to it in time hoping to have enough coins. Trust me The Krypt is a great feature. Most early updated MK games kept majority of content. Starting with the reboot to up, you could wait until the final version comes out with most to all of it's dlcs. Sadly Street Fighter never actually did this. Yes they give you a few versions you can download but still have dlc to buy. I also like in MKX's disc, all of it with a handful of dlcs are missing are present on it. Also the covers for those versions are amazing. Street Fighter 3 did have Akuma until Third Strike. 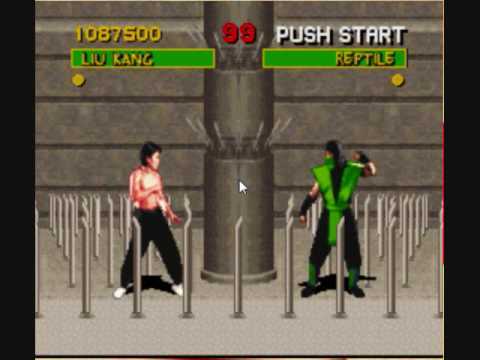 Mortal Kombat: Trilogy allows you to play as all the bosses at the time. You even had a character that was all male or female ninjas rolled into one. I also like those newer updated versions are lowered in price. Let's be honest this picture above is the perfect example. Officially Street Fighter II got six updated versions. Each title kept getting more ridiculous to some degree. Street Fighter IV really went over board with the titles. A summary of it is we went from original SFIV to Super Street Fighter IV to Ultra Street Fighter IV. Also how many times do you need to make a updated version of a game Capcom? The most Mortal Kombat did for any of them was two. Both of MK3's updated versions had a much better title too. The rate they were coming out for SF was enough for me to stop caring. I do like how there exists three versions of SF3. Oh okay that's fine but look at how many versions of SFII & IV there are I'm not kidding. Last I checked it sounds like SFV might suffer the same curse. Some ports change little to a lot like an HD remix of SSFII Turbo or Ultra Street Fighter 2 that adds Violent Ken & Evil Ryu to the roster. Also they made a newer official SNES version in smaller quantities. I know Street Fighter II was technically the first real good fighting game. But seriously was all of this absolutely necessary guys? I can't believe SFII had so much content thrown all over the place. Some versions of SFII removes the bonus stages. Honestly this by itself is why I really prefer Mortal Kombat series.